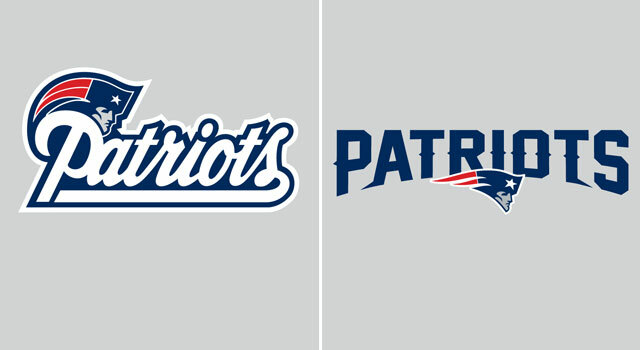 A few weeks ago, there was a rumor that the Patriots would be changing their wordmark. It wasn’t confirmed until the team sent out a press release on it. As you can see, gone is the cursive and in with the generic mid-serifs. I am not on board with it. I liked the previous wordmark and the changes don’t really stand out to me. Does that mean their uniform will undergo a change at the collar? This new wordmark is very unimaginative. The serifs don’t appear on two of the letters and I think I’ve seen this font before. Where? Oh I know. I saw it all last year. The tails look pointless and it reminds me of this. Change for the sake of change. Not needed and not a fan. This entry was posted in Logos, New England Patriots, NFL, Uniforms & Design and tagged Wordmarks. Bookmark the permalink. ← Will Manny Ramirez find his way back to the majors after signing minor league deal with Texas?